Година: 2019 12 х 42 мин. No Man\'s Land Day 87-391—Jim Gordon and Bruce Wayne face the chaos Gotham City has become. Their mission to keep the city safe becomes more complicated as the villains who survived the attack on the city begin to resurface and claim various territories. Selina Kyle grapples with how to deal with her uncertain future. A military task force, led by Eduardo Dorrance is called in to provide relief to Gotham. Meanwhile, Nygma looks for answers from Penguin, who leads him back to Hugo Strange. Then, Bruce is concerned about Selina\'s recent behavior. Gordon assembles an unlikely team to protect Gotham from Eduardo Dorrance and his Delta Force. Just as Lee Thompkins resurfaces, Barbara reveals shocking news that will change Gordon\'s life forever. Meanwhile, Selina and Penguin team up to outsmart fellow villain Magpie. 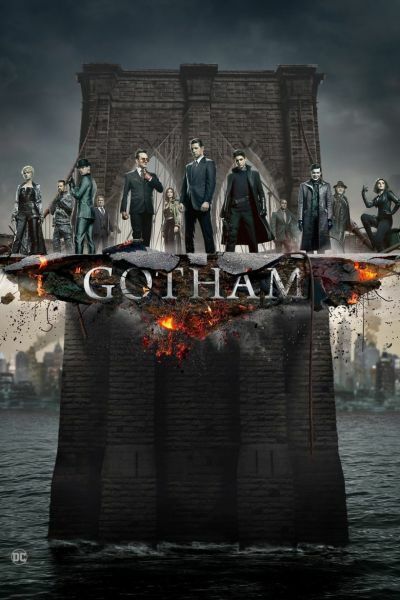 Gordon races to uncover the criminal element threatening to end talks of Gotham\'s reunification with the mainland. A very much alive Jeremiah returns and organizes a twisted recreation of the murder of Bruce\'s parents with the help of Jervis Tetch aka Mad Hatter. Епизод 9 - Какво са направили?